4/29/13 The cows finally went out on pasture today! The grass still has some growing to do, but the ladies of the barn were happy enjoying the sunshine! Our Australian Shepard, Bella, got to bring the ladies back in for milking time. I'm pretty sure she was smiling in the picture. Our cows eat other plants besides grass for a reason. I have been getting a lot of questions on what and how we feed our cows. Are they 100% grass-fed? Yes, they are on grass, when the grass is available. No, they are not 100% grass-fed.Let me start with this, there is no place on earth that grass is 100% nutritionally available all the time, even in warmer climates. That is why the camel and the wildebeest have humps. They eat all the best green nutritional grass they can during the wet season to store the nutrients in their humps for the dry season. The dry season has grass too but not the same nutrition in the grass as before. The buffalo that once roamed the big grass plains, didn't just eat grass. They roamed for a reason. They would roam to different areas for different nutritional reasons. Some fields would have plants that were fully headed out with seeds. Yes, they ate the grain of those plants. So even those animals weren't 100% grass-fed. This leads me back to the cow. Dairy cows have come a long way for their ancestors. They have been bred to produce milk, a lot of milk. A cow that once grazed and was just for one family produced only one maybe two gallons of milk a day. Today's cows produce five to eight gallons of milk a day. That's a lot of nutrients leaving a cow's body in just one day. They have to eat enough nutrients to make milk and keep their body healthy. Now we throw another factor into this, that cow will be bred to get pregnant. She now has a fetus growing inside her, giving five to eight gallons of milk a day and keeping her body healthy. She is suppose to do this all on just grass! The buffalo didn't even do this on just grass. Our cows can do this if it was spring here all year round. The grass is young and fresh and in the early stages of its life cycle, full of protein and energy. However, there are three other seasons that get their turn. The grass is still good in the summer but not as good, because it too is getting ready for seeding in the fall, then lays under the snow in winter. If you followed a cow around in a field she doesn't just eat one type of plant. She eats many types of plants. She knows what her body needs. That includes grains. Farmers don't have the roaming spaces that the buffalo once did. So farmers produce forage that will feed the cow to help maintain her health. But even the best hay forage can't compete nutritional with fresh grass. 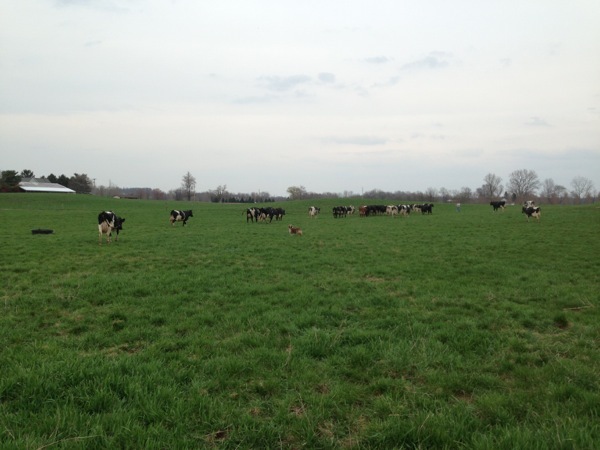 Our cows get grass from the pastures, spring, summer, fall. We make hay and grow corn, for them so they can eat during the winter months, when the grass isn't available. They need the protein and energy from both the hay and corn for the winter. If you still don't understand or think that today's cow can live off of just 100% grass, I will leave you with this thought; A woman, that is pregnant, and only eats lettuce, how healthy do you think she and her baby will be? These are my thoughts and opinions only! Even the honeybees are confused! 3 words that can make a dairy farmer JUMP! [slideshow]Life on a farm is never boring but I'm glad yesterday is over. Around 11am yesterday, my husband came in from finishing morning chores. I was standing in the kitchen and happened to look out the front window of the house. I was surprised to see...COWS! Those three little words that make a farmer JUMP are..."COWS ARE OUT!" We couldn't get out of the house fast enough. We ran for our boots and coats. Yes, it's cold in Michigan this time of year. The dog and I went out one door to cut them off and my hubby went out the other door to start the snowmobile. The whole milking herd was out of the barn and heading to the neighbors yards and fields. We did round them all up and put them back on pasture. We had to fix the gate they opened. Milk production went down that night. But the cows seemed to be perfectly happy with themselves. Those are three little words I don't need to say or hear again for another year at least!